According to a Vanguard report, one Mrs Bukola Osukoya who is worried about the dangerous aftermath of genital mutilation on the girl-child in Nigeria, has called on Nigerians to save her 11-year-old daughter, Jolade, from her in-laws who want to forcefully subject her to genital mutilation in the name of family tradition. Osukoya, who has often been threatened by her husband’s relations, said she was forced to cry out knowing full well that the family remains adamant about the barbaric act. According to Osukoya, her husband’s family head, Mr Wasiu Kasali has been pestering her to subject her daughter to female circumcision. Narrating her story, she said: “When this issue started, I thought it was a joke until I was confronted and in the past few months, things have gotten worse, with constant diabolic threats to deal with me and my daughter if they are not allowed to circumcise my daughter. “I have constantly refused the family’s dangerous intention because of the numerous accounts of many of the young girls in the family, who had been needlessly sent to untimely death on the altar of genital mutilation. “The family claims circumcision is part of their tradition and my daughter must be circumcised. Many children in the family died due to circumcision and I am totally not in support of this,” she said. Jolade’s mother, who currently resides in Osogbo, Osun State capital, refused to let the family perform the circumcision, because this is an experience that she would never want anyone else to undergo let alone her only daughter. 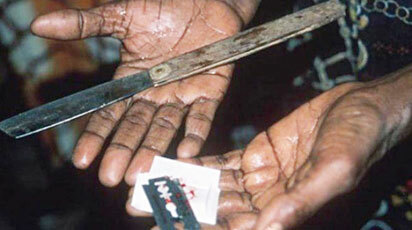 “Many wicked uneducated people still indulge in the deadly act of female genital mutilation. I call on well meaning Nigerians and public spirited organisations to help lead the advocacy against this challenge. “In veiw of this, I am crying out for help because I do not want my daughter to go through this painful process or get killed,” Osukoya said. She didn’t want her daughter to undergo Female Genital Mutilation), due to the danger and unpleasant stories she has heard concerning female genital mutilation in the family. According to WHO, “Female Genital Mutilation, FGM, includes procedures that intentionally alter or cause injury to the female genital organs for non-medical reasons. The procedure has no health benefits for girls and women. “Procedures can cause severe bleeding and problems urinating, and later cysts, infections as well as complications in childbirth and increased risk of newborn deaths. “More than 200 million girls and women alive today have been cut in 30 countries in Africa, the Middle East and Asia where FGM is concentrated. FGM is mostly carried out on young girls between infancy and age 15. “FGM is a violation of the human rights of girls and women. Female genital mutilation comprises all procedures that involve partial or total removal of the external female genitalia, or other injury to the female genital organs for non-medical reasons. “The practice is mostly carried out by traditional circumcisers, who often play other central roles in communities such as attending childbirths. In many settings, health care providers perform FGM due to the erroneous belief that the procedure is safer when medicalized. WHO strongly urges health professionals not to perform such procedures. “FGM is recognised internationally as a violation of the human rights of girls and women.
. It reflects deep-rooted inequality between the sexes, and constitutes an extreme form of discrimination against women. “It is nearly always carried out on minors and is a violation of the rights of children. The practice also violates a person’s rights to health, security and physical integrity, the right to be free from torture and cruel, inhuman or degrading treatment, and the right to life when the procedure results in death”, the study says.